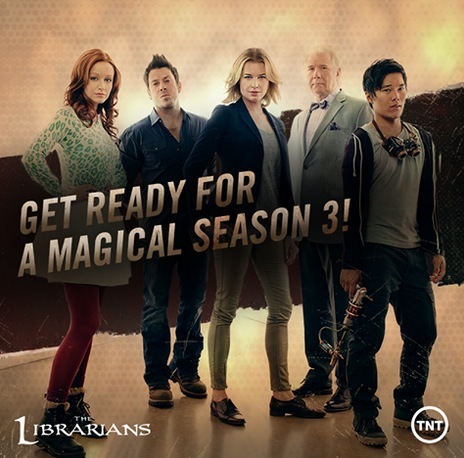 First, let me express my great joy that The Librarians has been greenlit for a third season. 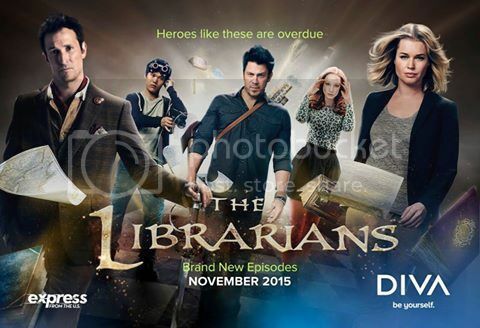 Second, let me state that The Librarians has supplanted Doctor Who as my favorite sci-fi/fantasy show. The latter has grown tiresome, tripping over its hopelessly jumbled lack of continuity and making less and less sense every season. The former, on the other hand, has something Doctor Who no longer has: a sense of joy and wonder and sheer unapologetic delight. The Librarians is a show that lets our characters breathe, grow, and has built around the characters a sense of family. These disparate characters (and the actors who play them) have built themselves into a strong whole, each of them complementing the other. A surprising number of Librarians episodes were built around character development, starting from the opening episode And the Drowned Book, where we saw what happens when the other Librarians branch out on their own. It's interesting that And the Drowned Book as well as And the Happily Ever Afters gave us a mirror reflection of Librarians Stone, Jones, Cassandra, and their Guardian, Colonel Eve Baird. In both of these episodes, the characters got to live out life as they might have if they did not have the other Librarians in their lives. In the former, they had split up and focused on what they do best. They certainly did good jobs in their individual tasks, but they also found that united, they were sharper, more focused. And the Drowned Book did a great job of showing that they were different people, with different interests and skills, but that they could work together as a unit and bring out the best in each other. And the Happily Ever Afters did a similarly great job in presenting us the characters as they themselves would like to be. It's interesting that in this episode, the various Librarians still found each other and worked together, still amplifying their skills. However, their idealized versions of themselves didn't allow for the conflict between them (for example, Jacob Stone's worldview versus the film & television ideas from Ezekiel Jones). These two episodes gave us a world that was like the one we know from The Librarians, but it was not a world I think we would want to be in. We want to see this informal family together, sometimes squabbling, sometimes finding each other's particular quirks and passions bizarre, but who in the end really do find commonality and a shared purpose. It isn't just about protecting the world. It's about having each others backs. What Season Two did remarkably well is give us insight into the various characters' inner life, what made them tick. And What Lies Beneath the Stones is an excellent example. We get to explore why Christian Kane's Jacob Stone would hide his tremendous gifts and love of art and architecture. Stone faced the pressure to conform to an image that was a version of him (he was an Oklahoma country boy and proud of it) but which also created an alternate version, one that forced his artistic appreciation to be buried. Once he was finally free of living up to false ideas, he could be more himself. The same with John Kim's Ezekiel Jones. He has evolved to be a more caring individual, one who sees that having ties makes one stronger, not weaker. 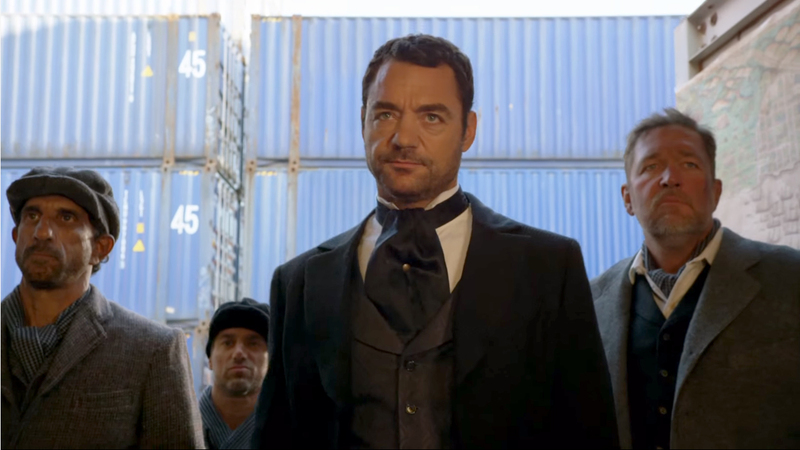 In And the Point of Salvation, Jones has to see the others die and die again. Despite himself, he finds he cannot bear seeing them go through this, even as he knows they have never really died. Jones has grown to see that while he may keep trying to keep himself apart from them, he has grown to care about the others. "I'm not your friend, but you all are my friends", he tells them. It's an acknowledgement from this kid that not only does he need them for their own individual skills, but that he needs them as one needs friends and family. One of the great highlights of Season Two was David S. Lee as Moriarty, the Napoleon of Crime brought to life by Shakespeare's magician Prospero. Lee made Moriarty into a simply perfect mixture of menace and mirth, equal parts threat and comic relief. We see this established quickly in And the Drowned Book, when Prospero calls him 'villain'. "Villain? ", Moriarty says. "I much prefer 'antagonist'". Lee makes Moriarty into the Librarians' first frenemy: his determination to follow Prospero's commands mixed with his unrequited love for Colonel Eve Baird (Rebecca Romijn), whom he constantly refers to as "Duchess". Moriarty is a dangerous foe, but Lee makes him charming, even innocent in his own way, particularly whenever Eve appears (or appears to come closer to Noah Wyle's Flynn Carsen). The bizarre love triangle (thanks, New Order) of Moriarty, Baird, and Carsen proved how funny love can be. The performances from each cast member are all perfect for their characters. Lindy Booth's Cassandra Cillian still is the sweet-natured girl who loves life (especially since her time is so limited). Christian Kane's Stone was allowed to show a vulnerability and hurt that would have been almost unthinkable when we first met him in a bar. Kim's Jones too gave some more depth to Jones (though he maintains his stubborn immaturity). Let us not forget the great John Larroquette, who shows us why he is a real ACTOR, capable of drama and comedy. His character of Jenkins (or Galahad, if you like) still is generally stuffy and takes the world of magic for granted (his exposition dialogue coming across almost as naïve about how bizarre it should sound). However, in And the Infernal Contract, we see that Jenkins is just as capable of getting into things as others (his quick reaction to Cassandra as his 'sugar baby' smacking his behind...priceless). While we see that he is still as formal as ever (always "Mr. Carsen, Mr. Stone, Colonel Baird, Miss Cillian"), we do see him slowly showing a more in-touch side to Jenkins. At the end of And What Lies Beneath the Stones, it is surprising to hear him reply to Stone's query about family dynamics, "What I'm saying is that family ain't easy". This turn of phrase would come naturally to the country boy Stone, but not the formal Jenkins, brought up at Camelot. When he reminisces about his long-gone friend King Arthur in And the Final Curtain, Larroquette lets Jenkins' mask drop slightly, to reveal a sad, maybe even lonely man, who knows he cannot be killed but can die. I think in an interview Larroquette said that was a way for the writers to get rid of him should they want to, but given that after Jacob Stone he is my favorite character (and I suspect the favorite of a few others), Jenkins will be as droll as ever for a few more seasons. Now, what of Season Three? Well, will Flynn stay? Wyle, as far as I know, does not have the commitment to Falling Skies, and Flynn Carsen is one of his best-known characters. However, I read faint rumblings that whenever Wyle appears, things go askew. I don't think so, but I do believe that the issue has to be settled one way or another. If we remember from the pilot episode And the Crown of King Arthur, both Jane Curtin and Bob Newhart's characters were essentially written out quickly from the series despite them being in the three Librarian movies. I suppose it was because neither wanted to come back for a full series. I think this was if not a great decision at least an understandable one. We needed Season One to flesh out our disparate group and have them work together. They did so successfully, so successfully that anyone who started without seeing any Librarian movies simply does not think of them anymore (though it might be nice to have them guest star on an episode). With Season Two, we got more of that common-goal teamwork they've done so well, and got to see more character-centered stories. However, Flynn Carsen's reasons for popping in and out are starting to become more and more far-fetched. What's the point of having three Librarians and a Guardian if you as the Main Librarian are going to task yourself with searching for artifacts when they've proven time and again they are just as capable as you? They all work so well together that we can't have them end up becoming Flynn's backup dancers: the Joey, Lance, Chris, and J.C. to Flynn's Justin Timberlake. The issue of what will happen to Flynn Carsen has to be addressed in Season Three. The ambiguity cannot continue. Will Flynn stay within the Library? Will he keep popping in and out? It isn't that The Librarians hasn't integrated Flynn into stories well. It's just that it's getting harder and harder to justify integrating Flynn into stories. It is possible to have Flynn Carsen be part of The Librarians without overshadowing the other Librarians, but unless they trap him like K-9 in The Sarah Jane Adventures finding ways to have him not be at the Library is going to be harder on everyone: writers and viewers. That, is of course, for later this year. 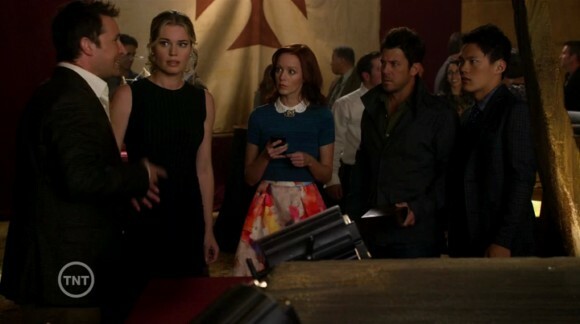 On the whole, The Librarians Season Two continues its great mix of humor, action, and fantasy. It has solid performances from the cast and an especially great one from guest star David S. Lee as the charming rogue Moriarty. It continues to be unapologetically fun and family-friendly. In short, Season Two turned out better than Season One, improving and building on what came before. I hope Season Three will build on its world with more character-based stories...and a return of Moriarty...and another swordfight from Jenkins (which I'm STILL waiting for).